Harman researchers Sean Olive, Todd Welti, and Elizabeth McMullin have continued their tireless treck towards a subjectively preferred headphone target response curve since last I reported on their efforts. The most recent paper shows their grip on the subject ever tightening and, to my eyes, giving us a clear way forward to better sounding (read: more pleasing) headphones. In a previous paper, "Listener Preference for Different Headphone Target Response Curves" the team subjectively tested a number of headphone target response curves and showed that listeners preferred curves designed to mimic the sound of good speakers in an acoustically well designed room. The In-Room target responses for this previous paper were basically very educated guesses about what a headphone would sound like if it mimicked speakers in a room. The paper of current interest essentially tests these curves in a series of subjective evaluation experiments to home in on the exact curve that listeners find most pleasing. "Listener Preferences for In-Room Loudspeaker and Headphone Target Responses"
Are the preferred in-room loudspeaker and headphone target responses the same? Can the current recommended in-room loudspeaker and headphone target responses be improved upon with more research? To what extent is the preferred target response influenced by program, individual taste, and the methodology used to measure it? I'll try my best to summarize the paperit's quite complicatedbut it's of such import to headphone enthusiasts that I highly recommend its purchase. You can find the paper here in the AES library. Cost is $20 to non-members, and $5 for AES members. The first part of the paper details the calibration to absolutely flat of a reference speaker system in a listening room, and a headphone (Sennheiser HD 800) who's response was carefully compensated in order to match the flat response of that listening room. Then two tests were designed that allowed the listener subjects to adjust carefully designed bass and treble controls for listening preference. In one test, bass was set at one of two different levels and listeners were asked to adjust the treble for best listening pleasure. Then the treble was set to one of two different levels and the bass adjusted. In the second test, subjects were allowed to adjust both bass and treble for maximum listening pleasure. These tests were done with both headphones and speakers in a room. Eight trained listeners and three untrained listeners were used in the tests. It's important to note at this point that a flat speaker in a typical home listening room does not sound flat. Due to the ever decreasing dispersion of sound from a direct radiating speaker as frequency rises and the low frequency gain of a small room (boundary effect), the actual sound power in the room is somewhat more bass heavy than the flat anechoic response of the speaker. This is normal, and it's believed that we expect and desire this warm tilt with speakers in a room. The primary purpose of this test was to see exactly how people EQed the speakers and headphones away from flat, how much, and if there were differences between the preferred speaker and headphone response. It was found, generally speaking, that the preferred response was a warm tilt with about 8dB difference between bass and treble at the extremes. It was also found that people preferred speakers to have about 2dB more bass and treble relative to the mids than headphones. Our expectation was that listeners would prefer more bass in the headphones to compensate for the lack of whole-body vibration and tactile cues that may have been present in the loudspeaker reproduction. That was proven not to be the case. Now, I've left out all sorts of interesting details in summarizing here: How amazingly different recording studio reproduction systems are and how there are no comprehensive standards for control room speakers, and how that leads to serious confusion about the neutrality of recorded music to start with. How the program material used didn't seem to have too much effect on results, but listener training did. I will, however, highlight one particular and very interesting finding: The target response curve for headphones. With Sean Olive's permission, I give you the headphone target response shown in the paper. 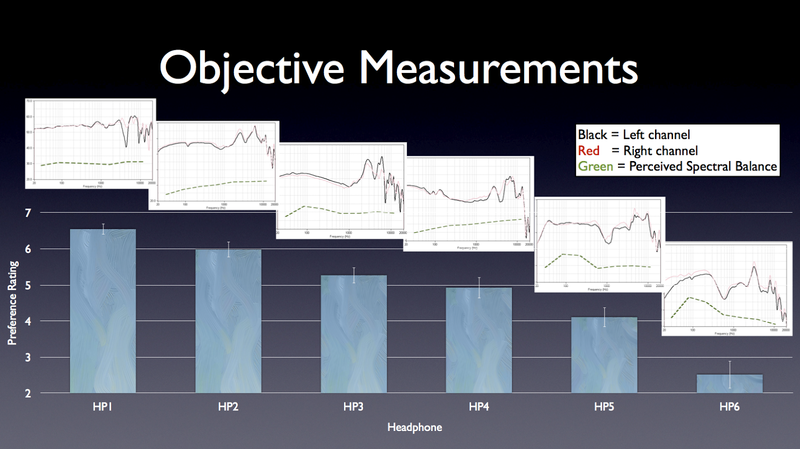 The preferred headphone target response measured at DRP (black) based on this study. Also shown is the measured response of the loudspeaker equalized to a flat in-room target response. The plot above shows the frequency response measured at the ear drum (DRP) of a flat in-room speaker response (dashed green line) and the new target response curve developed in the research. These curves are essentially what should be seen with ideal headphones in the raw (uncompensated) measurements on InnerFidelity headphone datasheets. In the graph below, I've superimposed the raw responses of the NAD VISO HP50 and Focal Spirit Professionaltwo headphones that I find very neutral to my earsagainst the target response curve. It's a bit of a hack job, so please excuse the mess, but I think it's quite interesting. The NAD is the top set of gray traces, the Spirit Professional is on the bottom. I've not spent any time (yet) looking through the headphone measurements to find others that are close, but you can bet I will. I will alsothough it will take a whilespend time creating a compensation curve for the measurement spreadsheets and stick it into a dozen or so headphones for a look-see. In the '80s when Sean Olive (with Floyd Toole and Paul Barton) did work like this at Canada's National Research Council on developing a target response curve for speakers it sent shock waves through the speaker market. Where speaker tonal response was previously all over the map, after the studies concluded and speakers developed thereby sold well, the speaker market changed rapidly in response and speakers became much more similarand bettersounding. It's my fondest hope that this research will cause a similar rippling through the headphone market, and that we'll see many better sounding headphones in the future. When will we see products from Harman developed in light of these findings? My communications with Sean this week have me believing it will be sooner rather than later. Keep a watchful eye on future JBL headphone offerings! For more information see Sean Olive's blog post here, and my previous article. But most of all don't miss this excellent summary of their work to date in this PDF Powerpoint slide series. Hmmm, this doesn't reflect my own experience. Etymotics have a similar measured bump at around 3Khz, and reducing it (by about 5dB) makes for an audibly flat sine-sweep while also massively, and I mean massively, improving the audio. Whatever the compensated charts say, which remove the bump, I can clearly hear it. This also seems to contradict the previous findings, that listeners prefer that bump removed. Is there a problem here, or am I missing something? The ideal target response for an over-the /on-ear headphone may not be the same as for an in-ear headphone, like the Etymotics. Also, last time I checked the Etymotic's were flat in the bass, and didn't include the typical bass reinforcement from room boundaries and resonances. In a previous study (see http://www.aes.org/e-lib/browse.cfm?elib=16768) where listeners directly evaluated different target curves we included as modified DF-calibrated target response based on Lorho's work. This target response at DRP has the 10 dB 3 kHz peak reduced to about 3 dB. It was less preferred than the Harman target curve and the unmodified DF curve. A similar finding was reported in an AES paper by Fleishmann et al. What I found was that if I took out the whole 12dB that it was as that previous study you mention found, not so great, interesting, but not doing it for me. Tyll then suggested that the reduction probably shouldn't be the whole 12dB of the graph, which I think makes sense in terms of loudness curves (http://en.wikipedia.org/wiki/Equal-loudness_contour ). I then did proper sine sweeps and reduced only by 5dB to flatten the bump, and get an overall flat sounding sweep. At that point the etymotics were transformed. The bass actually become decently present and enjoyable - no more bass shy etymotics - which presumably was due to being able to raise the volume by 5dB where that bump in our hearing's more sensitive area otherwise constrains one. So what I took away from that is that the bump in the unadjusted graphs is real, and that removing it improves the audio. I found the same with my superlux which has a similar bump (which again doesn't appear in the adjusted graph). "This also seems to contradict the previous findings, that listeners prefer that bump removed." "These new findings contradict the previous findings which were that listeners preferred the bump removed." ...but obviously, not by the full 12dB. ...and I should mention, as it is directly pertinent to what you say, that the Superlux headphones are circumaural, not in-ears. Where is this previous research you mention? I doubt that equalizing the headphone to make a sine sweep sound flat is the proper methodology, because discrepancies in loudness across the frequency spectrum due to equal loudness contours is how we normally perceive sound and not a flaw to be fixed. I think you may be thinking about this from the wrong perspective. To explain: A musician with an instrument whose peak is at 3Khz is going to reduce their volume if it is perceived as too loud by the conductor. And because of the loudness curves (where there is a bump in sensitivity at 2-3Khz), it will be arguably perceived as too loud for the same dB as the other instruments. The dilemma is that since a boost is natural, one could argue that the instrument should remain at the same dB as the others, that at the very least, the perceived extra loudness will improve the subjective experience. I think that dilemma is at the root of this issue. That more recent research suggests the latter view. However that could be explained by the listeners, trained and untrianed, if they are already neutrality purists (see more on that below). How where they selected? I'm not really in a position to decide that issue, but I know what I'm hearing, and removing the headphone's boost by 6dB to get perceptual sine-sweep flatness (vs the measurements) is massively improving my music, and bringing back the bass. So I would argue that indeed the boost is a mistake and should be equalised out. So the HRTF is compensating too much and not reflecting what we actually hear (which may be partly explained by loudness curves and actual listening levels). I think the general liking of bass boosting also reflects that. They aren't really going for mega-strong bass, rather looking to get equal perceptual volume, and then sooner or later progressing to boosting treble (which is the transition of maturity noted anecdotally at head-fi, basshead->treble-head->mids, which I would suppose is ending at real neutrality). This would also suggest that etymotics listeners are either deaf (which mostly affects that region) or convincing themselves out of a love of 'purity' riding on the back of the etymotics reputation, but that which is beholden to the wrong audio theory, diffuse field (which mandates that 3Khz boost). Not being a purist I boosted bass by 12dB, now reduced to much less and only at around 30Hz where the drop-off is. However, if one is aiming to accurately reproduce sound as it is in a room, which is arguably not natural even for cave dwellers, then it shouldn't be flat. But that doesn't necessarily make for better sound, just more accurate gig-noise reproduction. And it's complicated by the fact of reinforced bass from reflection, giving a bass boost one would otherwise get by turning up the bass. In the meantime, another added complication is volume levels. I sine-sweep well below my listening volume as otherwise even without pain I get some kind of (very temporary) slight tinnitus. That 5dB reduction is likely not the figure I really need to get optimal audio. Perhaps I should try ABXing 5dB vs 3dB reduction. You still haven't shown/referenced the alleged contradictory research. You have merely stated your personal preference in an overly verbose way; "I know what I'm hearing" and other such anecdotes make no compelling argument. Here's the reference : http://www.innerfidelity.com/content/harman-researchers-make-important-headway-understanding-headphone-response , as also given in the article. What I wrote was not overly verbose. I've carefully explained my reasoning, and it doesn't require that reference while addressing what you wrote in your second post. But to sum up: this second bit of research may be flawed due to the choice of listeners. However, this preference rating was done by trained listeners, too, so I don't find your hypothesis of expert bias with regards to "neutrality" likely. Overall, these two studies do indeed seem somewhat contradictory, though. Tyll I gave a quick runthrough of your measurements and did some calculations of the researched response curve at Harman and arrived at these conclusions. The Harman respone curve shows a gain in 12-13db from 200 to 3khz, then a reduction in db in 12-13db again once the headphone hits 10khz. There's also the 5db boost in bass by the time the headphone reaches down to 60hz and below. Using those numbers I found the HD580/600 to get close to this in the mids-treble, minus a lower treble null, and the Focal Spirit professional to hit that on the money from bass to lower mids. After all of my glancing at your headhpone measurements, the Focal Professoinal seems to get the closest to this response, minus the lower treble null. Otherwise it's very, very close. Is the dip/peak leading up to 10kHz desired? I'm not sure how relevant this is, but I've noticed that the response curve shown in this article is fairly smooth from the 3kHz peak down to 20kHz. But nearly all headphones measured on Innerfidelity have a pretty significant dip somewhere around 7-8kHz, for then to have a sharp rise (>10dB) up to a 10kHz peak. Is this a technical limitation that current headphones cannot circumvent, or is it desired? It could be that I'm mixing two completely different aspects here, so I hope that my post does not introduce unnecessary confusion. There is considerable individual variation in HRTFs above 5 kHz. Dummy heads represent an average or typical head. It might be that manufacturers introduce a treble null so that the headphone does not sound harsh to a large fraction of the population that deviates from the norm. Of course, that might also make it sound duller to others. Your theory that it is a technical limitation sounds just as plausible. I went ahead and looked at the frequency responses in the datasheet library and I didn't have to go far before I saw the HD600's response and noted how close it is to this new reference curve. This possibly basically explains why this headphone is so widely accepted and praised among headphiles. Thoughts, anyone? "Keep a watchful eye on future JBL headphone offerings!" We aren't talking about the JBL Synchro S700 headphone, I presume? Does that have the new DSP target curve? Well it has some kind of DSP target curve. if listeners do not prefer a bass-boost in their headphones why does the headphone ideal response curve (black solid) is 5dB higher at 20Hz than the speaker's one (green dashed)? the AKG folks gave their listeners two controls: a bass and a treble knob. That allows them to pinch up and down the response curve from two points in the frequency range. I wonder how they can then derive from that an "ideal headphone" response curve across the spectrum. Should not have they given their listeners more knobs to turn, so to speak, or a graphic equalizer? 1. No one said listeners don't prefer a headphone target curve with bass boost. The graph (green dotted curve) shows the in-room speaker curve equalized to flat before listeners adjusted the bass and treble level to taste. It's not shown in this graph, but listeners on average preferred about 2 dB more bass and treble boost compared to the preferred headphone target curve (black curve). 2. The headphone target curve is derived from an accurate loudspeaker (e.g. Revel F208 flat on-axis, smooth sound power) measured and calibrated in a good listening room. Below 200 Hz, the room dominates the quality and quantity of bass heard. Above about 1-2 kHz the directivity of the loudspeaker and the room's absorption characteristics influence the quality and quantity of treble. That was the rationale for choosing the shelving filters and frequencies used for the method of adjustment Additionally, we did earlier listening experiments where the bass/treble filter frequencies were adjustable, and found that these final frequencies were good choices. If we gave listeners a graphic equalizer it would a) make their task extremely difficult, and b) not likely repeatable. Moreover, c) the experiment would no longer be based on our hypothesis: that a good sounding headphone should approximate the in-room response of an accurate loudspeaker in a reference listening room. P.S. BTW, the final preferred treble gain for the loudspeaker was essentially 0 dB. In other words, listeners didn't want to change the Revel F208's frequency response above 200 Hz. This tells us that If you design a loudspeaker so it measures flat anechoically with smooth directivity and sound power, there should be no need to apply room/speaker correction above the room's transition frequency (e.g. 200-300 Hz). 2. You'd have to read the paper for a detail reasoning of how they chose the shape and adjustment envelope of the bass and treble adjustments. But basically they knew where flat was and they knew the curve needed to be adjusted in bass and treble reative to that curve. Having only two adjustments let them make more statistically significant adjustments with the sample size of subjects they had....I think. Edit: Sweet! I see that Tonmeister (Sean Olive) has answered the above at the same time as I was posting. My comments, of course, should be discounted, but I'll leave them there for your viewing pleasure. thanks Sean and Tyll for your replies. Now I understand! Really encouraging to see interest in advancing headphone characterization, and hopeful this will have a positive impact in product sound quality. Probably doesn't matter given the two loudspeakers seem quite good, but why the Revel 208 and not the Revel Ultima Salon 2? It may not be exactly the same curve, and don't know about how controlled those measurements were, but he does show a gain from around 300Hz to the upper treble. As far as possible differences, he did say the room was a little smallish, and seems he had to remeasure some cans later on for consistency (proly positional sensitivities due to asymmetrical ear gain?). Interesting. I found that the KEF M500 which you don't like, seems to have a response curve almost identical to the Focal Spirit Professional. I have RE-400, Qjays, HD25-1-ii, HD700 and M500.Tried to play with EQ all of them to the new target response curve in black color. Afterwards all of them sounds similar, except the M500. The M500 perform very close to the new response curve sound signature without doing any EQ out of the box. Note in particular page 66. Notice that the natural ear response measured at the ear drum is very similar to Olive & Co.'s perceived flat headphone response. These measurements of various subjects' natural frequency responses reinforce why peaks and dips in certain upper-mid and lower treble frequencies will be percieved as natural sounding to some and harsh to others. Good information though. Hopefully we'll see some better designed headphones in the future as a result of their research. Also, Brent Butterworth has a review and measurements on stereos.about.com. Yes please, I would like to know his response, and I don't tweet. I'm also interested... Can you please share with me the information you have about the JBL S700? A sample group of 11 people is very small. Be that as it may, a prominent Head-Fi'er has sung the praises of the AKG K812, and speculated that the findings of Dr Sean Olive's research team may have influenced its sound signature. I suspect that Tyll doesn't subscribe to this view. So how do the measurements for the K812 compare to Dr Olive's headphone target response? Performing a perceptual evaluation on 11 subjects, and especially a group like harman's trained listeners will be sufficient to make a valid point and provide enough infrmation to the scientistis and engineers regarding the product's performance; and/or any perceptual aspect they are interested in, whether that's affective (like / dislike) or more importantly perceptual - which can pin point back to certain parameters in the physical domain. Typically a double blind test will have this amount of listeners; There's a long list of listening experiments in known journals with way lower number than this. If the results are significant with enough power, then it is enough for a research group to generalise over the certain population. You are right that there might be biases, especially in a listening test which only assess "preference" as it may include your personal taste, past experience and so on. This is normally avoided by performing standardised listening tests (1116; 1284 etc) or Simple BAQ test using trained listeners; trained in both listening experiments methodologies and in auditory processing skills. Cultural influence is something on discussion in such experiments and known parameters to keep in mind. I'm presuming that you're responding to my post. I regard 11 test subjects as a very small sample group, whether they are "trained" listeners or not. It is too small and specialised to extrapolate that the results would apply to a much larger and diverse population of headphone listeners. If that is typical of the number of subjects used in such research and testing, then I would be reasonably sceptical of the conclusions but not completely dismissive of them. I didn't get the impression from Tyll's article that Dr Olive's team was testing a specific product. I thought that they were conducting audio research; the results of which will most likely inform the development of future products from Harman. And I made no mention of biases in the testing process, so I don't know where you got that from or how you could agree with me about it. Using the above curve as a refence, the K812 doesn 't seem to score much better than other phones costing much less. The K812 is actually quite jagged in the upper end of the frequency band. Looking at Tyll's own graphs, the Monster Beats Pro score better in that neighborhood. Actually, the Beats Pro score better than the D5000s with J-Money Pads. The difference between this Harman target headphone response and the flat room reponse is virtually identical to the Bruel & Kjaer room reponse shown on page 4 of this document: http://www.bksv.com/doc/17-197.pdf , with the exception of a roughly 3 dB boost in the sub-bass for the headphone response. I remember reading on an audio forum somewhere that the B&K room response is used as a target room respose by some recording engineers--the poster to the forum seemed to think that it is used widely. This "ideal" resembles the "uncompensated" response of most Grado headphones. I was thinking the same thing. What a delicious irony that would be. Haha... and the lowly Superlux HD 681 beats them all! Ironically, I preferred this headphone, with velour pads and cheap pillow fluff dampening, to the Beyerdynamic DT880, AKG Q701 and Sennheiser HD600 by a mile before I knew anything of these graphs. Irony? I dare say no. Good stuff here Tyll and it's about time. I've been a long advocate of equalizing headphones at the ear and speakers to the room. We need to separate in-ear buds from over the ear, as these generally are quite different animals with different behavior characteristics, one from the other. I also see no utility in comparing speakers - flat or otherwise - to what we hear with headphones, as if one were a standard against which the other should be judged. No. Music is the standard, othewise we need to use personal judgement about what we hear at the ear and with experimentation we'll just know when we got it right. As in, bright does not mean more transparency or greater information retrieval. When you get maximum information retreival AND a natural sound...meaning you had expounged most of the artificial and the synthetic out of most recordings, you will know that you've gone flat at the eardrum. Our reaction to each ear phone will require individual adjustments, one may go in one direction while another toward another direction...there is no entirely "flat" earphone...there are flatter and flattest. Over time the flat may change to flatter or may need to be adjusted to become flatter. The hard science to explore these issues is all for the better and is worthwhile, necessary in fact, but I am reluctant to accept the measurements from one manufacturer for every adult ear...which may or may not hear the same things. I explore these issues in these links and these explorations are just beginning. More to come. I prefer my headphones equalized to flat sounding, not to sound like a terrible undampened room. Flat sounding equalization sounds like open space. The difference is on par in free field vs diffuse field EQ - more 3k, less bass. Good headphones actually reproduce spatial cues properly with such equalization provided a flat crossfeed is enabled and proper central channel mixing is done. Current preference is flat equalized Hifiman HE-6. With a good parametric equalizer. That blurb has a mistake - accurate phase response is a perfect impulse - nothing can do that. You can correct it, but not with typical equalizer - you need a phase equalizer. This can be spotted on CSDs as a bit where the decay is not proportional to amplitude at time zero. Generally a standard IIR equalizer will add a tiny group delay to the signal, frequency dependent, making the equalized frequencies lag a bit for a cut, while making decay shorter but steeper for a boost. We are all somewhat at the mercy of the recording engineers and artists and what sort of physical space they are working in. I would venture to guess that while most control rooms or mixing studios are closer to anechoic than most living rooms, that they at least check to make sure the music still sounds good with a "lving room" type response equalized in. I agree with you that this is not the ideal for headphones, but I think that the standard is to mix assuming two exernal speakers within a room. That brings up a slight problem that I see with the Harman research, namely that the room that they based initial response targets on as well as for "flat" uses a surround-sound system, which is not what is assumed with most recorded music. Nonetheless, in a later paper they allowed headphones listeners to broadly adjust bass and treble preference. I'm just thinking that there could be refinements to this depending on what kind of speaker arrangement is simulated. Good point, Rillion. We are indeed at the mercy of music makers who largely record and mix recordings through an uncalibrated playback chain where the performance of the loudspeakers and rooms are an unknown variable. If you look at a survey of in-room responses of the same loudspeaker measured in 164 professional control rooms, we can safely say the recording industry has zero QC in the monitoring chain through music is recorded, (see 2nd graph in http://seanolive.blogspot.com/2009/10/audios-circle-of-confusion.html ). The recording and consumer audio industries are trapped in a circle of confusion. The only way to get out ot this circle is to ensure the performance of the loudspeakers, headphones and room calibrations are the same in both recording and consumer playback chains. We need meaningful standards that define their performance that is accepted and put into practice.. Maybe not in my lifetime, but there is hope. In our first study on preferred headphone target response, we derived the target from in-room measurements of an an accurate 7-channel loudspeaker system calibrated in our reference room. In the more recent study, we used an accurate 2-channel loudspeaker calibrated in the same room. The measured in-room curves for the 7 versus 2-channel conditions were not much different, since we used accurate loudspeakers in both studies, and we equalized all channels to the same in-room target. As you point out, the second study allowed listeners to make fine adjustments to the bass and treble target responses in order to address any shortcomings made about the "ideal" target response evaluated in the first study. But until the recording industry gets better QC in their playback chain, the quality of recordings will be the limiting factor in how good your loudspeakers or headphones sound. Interesting....but everyone seems to have forgotten Crossfeed? Before you dismiss this post as off the wall.....I want to state that i was doing research work with NRC on blind audio preferences before Floyd Toole and made a good living as a researcher and designer of high end gear for quite a few years. That said ....why has none of this research mentioned the low frequency effects of headphone crossfeed circuits that have been aound for 30+ years? IF you are trying to compare natural room playback from standard speakers with that of headphones - the subjective summing effect of L+R signals <250Hz must have some impact on the preferences results....and the EQ that users would apply. I have Crossfeed switches on all of my various headphone amps and there is no doubt that I prefer it to dual mono AND that the subjective spectral balance is affected in the bottom end. I recognize that a really well designed experiment would need to control for summed power below 250Hz etc.....but why not include this? And.....if H-K wants to design in a killer user preference item for their phone - why not add a crossfeed switch to them as well as the tuning factors and give it a cool name like "Virtual Room"
Keep up the good work......thanks for sharing. This parallels my thinking as well. Many headphones already have a tilt up in the bass relative to treble perhaps in part to compensate for lack of crossfeed. Ideally, a headphone would not need as much of a bass boost for use with crossfeed. Knowing headphones tend to already include a bass boost, I made my own very basic crossfeed (modified music files) that does not change the average frequency spectrum (as confirmed with uncorrelated white noise into each channel). By contrast, most popular crossfeed implementations include a modest 2-3 dB bass boost that cannot be turned off without eliminating the crossfeed. I read Tyll's articles about the work of Sean Olive with greatest interest. It seems for the first time we now have got a clear definition of how a neutral headphone should sound. This is a real breakthrough and invaluable information for people like me who are dependent on reliably neutral equipment for listening controls at home. For this purpose I'd like to equalize my HD 800 and match it as near as possible to the Harman Target Curve. Unfortunatealy I have got only a rough understanding of these things and therefore don't know how to do it. Could anybody help me? Exactly which EQ changes do I have to do? Probably this information would not only be interesting for me but also for others who want to make their HD 800 be a really neutral and reliable working tool! Thanks a lot guys and all the best! Looking at the datasheets, it appears that the B&W P5 has a curve in the zone as well. I'm glad to see that this info is coming about. I went ahead and did some crazy tweaking on my AKGs in JRiver to get them to respond similarly to this curve and I really like the results a lot. I listen at relatively low levels and want to make a compensation filter based on the fletcher-munson curves. What was the average SPL in the harman experiment? In other words what loudness should I use as the reference for my compensation? Since they used a bunch of commercially-available music and people got to EQ it the way they wanted, basically this is just telling us what the mushy, historically-developed standard response of studio & mastering monitors developed into to compensate for even older recordings as well as microphone responses. Probably, however, those older recordings and microphones developed around the natural most-easy-to-engineer response of the oldest loudspeakers in a kind of feedback loop. I'm wondering how this may have changed over time. It's an interesting methodology and probably agrees with prior tests of average loudspeaker responses among mixing & recording engineers.